The P90X Pre-Workout Drink (Energy and Endurance Pre-Workout Formula) was designed for people who need a boost of energy before doing an extreme workout like P90X or Insanity. It wasn’t until after my third round of P90X was Energy & Endurance released. At the time I was buying pre workout drinks like 1MR and Jack3d. Neither of which I particularly liked. They both had a chemically taste to them. So when Beachbody released E&E with its lemon flavor I was hoping for it to give me that pre-workout buzz without the chemical factory taste. Before I get into that we have to talk about what Beachbody says E&E says it will do. 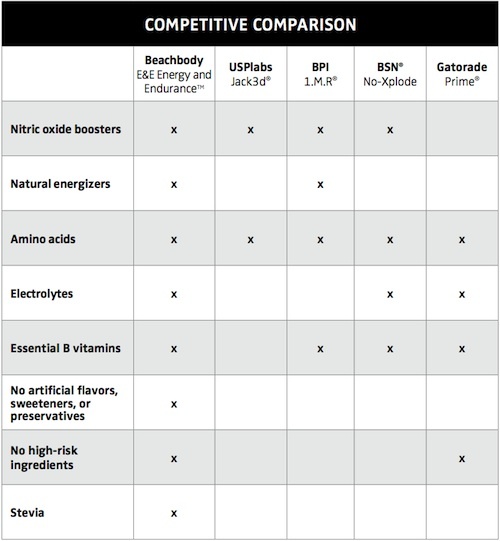 What Will The P90X Pre-Workout Drink Do? What Do The P90X Pre-Workout Drink Ingredients Do? And what I can say after a year of dropping a scoop of E&E into some water and slamming it before P90X, Insanity, a long bike ride, and even a swim is that it felt like it worked. I could definitely feel the tingles 15 minutes after taking it. And I seemed to be more focused for the first half of each workout. I cannot say for sure if I was able to do more reps or lift more weight but I did seem to be “locked in” through the workouts where I took E&E versus the ones where I did not take it. Lemon isn’t one of my favorite flavors but E&E didn’t have that chemically taste to it that other pre-workout drinks I tried had. In the end I think Beachbody’s E&E did what it was designed to do.